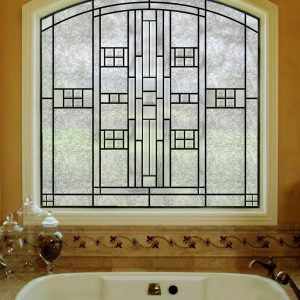 Are you considering bathroom stained glass for any of the bathrooms in your home? 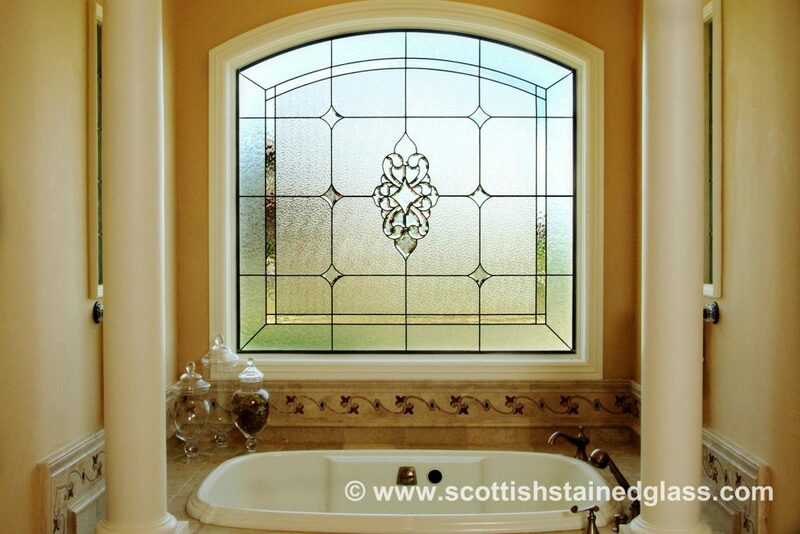 Bathroom stained glass is one of our most popular commissions. Our clients love decorating, they love turning every room in their homes into something that truly reflects their tastes, whether they are sophisticated and elegant, classical, funky and eclectic, or modern and minimalistic. And bathrooms are a part of that, aren’t they? Since we create custom bathroom stained glass designs, our clients can choose styles and designs that match and enhance the style and décor of the rest of the house. Or they can choose to go in an entirely different direction with the bathroom. 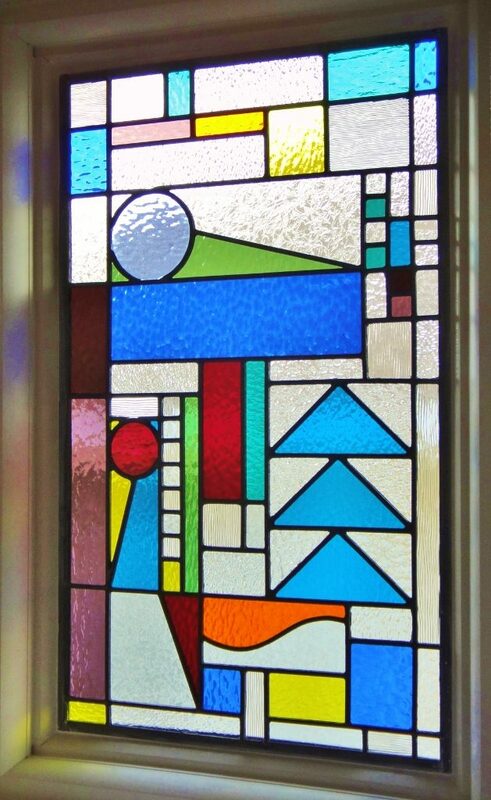 But there is another reason besides style and interest why bathroom stained glass is so popular. It adds privacy without blocking the natural light. If you have bathroom windows made of plain clear glass, you might have added shades or blinds to give more privacy. But with stained glass you are adding beauty no blinds can offer, along with the privacy you need. Perhaps your bathroom windows are already made of frosted glass for privacy. But you have to admit, plain old frosted glass is kind of boring looking. Imagine your bathroom with a stunning style upgrade in the form of custom stained glass windows, perhaps using colorless leaded and beveled glass. 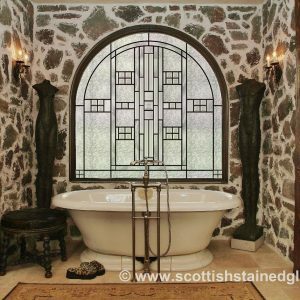 In fact, you don’t have to imagine it because we can show you many photos of bathroom stained glass we have done for previous clients in the past two decades. 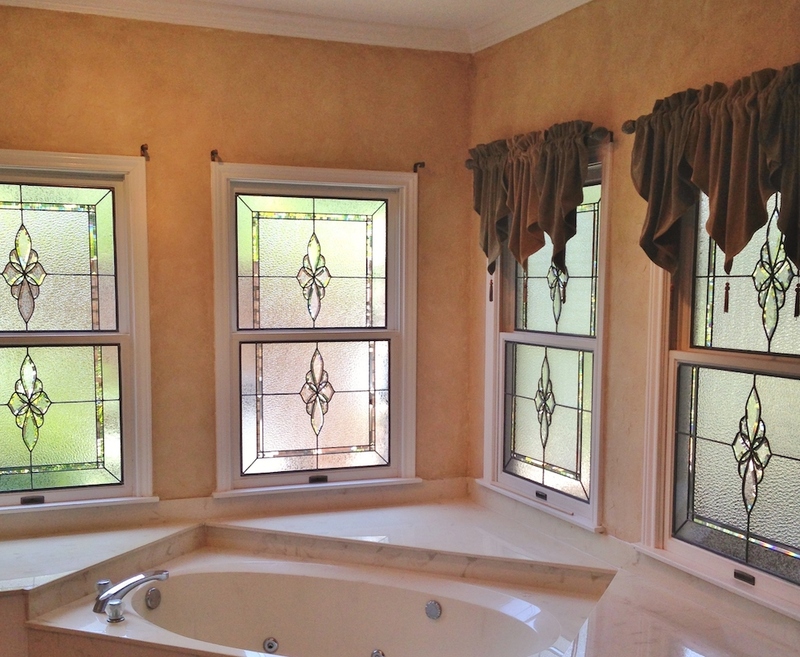 Click here to see our bathroom stained glass photo gallery. Click on any of the thumbnails to see an enlargement that shows off the lovely detailed craftsmanship. All of our custom bathroom stained glass windows (or doors!) are hand crafted, piece by piece. What style would you like in your bathroom stained glass? Something antique looking? Something modern and geometric? Something with flowers or trees? Or how about a Celtic design or an Art Deco design? 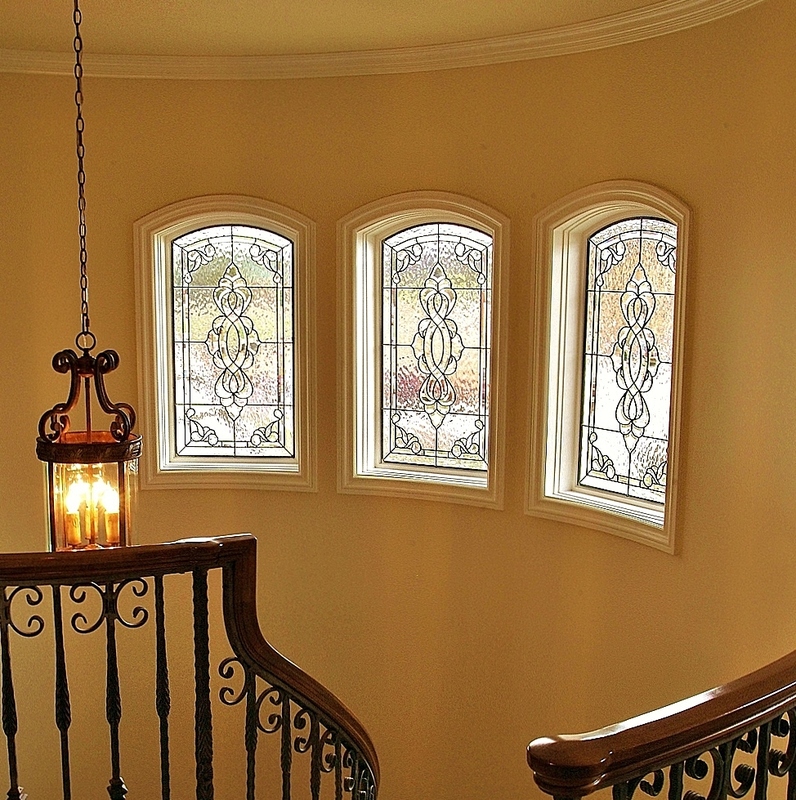 When it comes to stained glass style, there really aren’t any limitations on what we can create. By the way, if you are wondering how stained glass will hold up in a hot steamy bathroom over the years, have no fear! We use a special installation process when we install stained glass into a very moist environment. 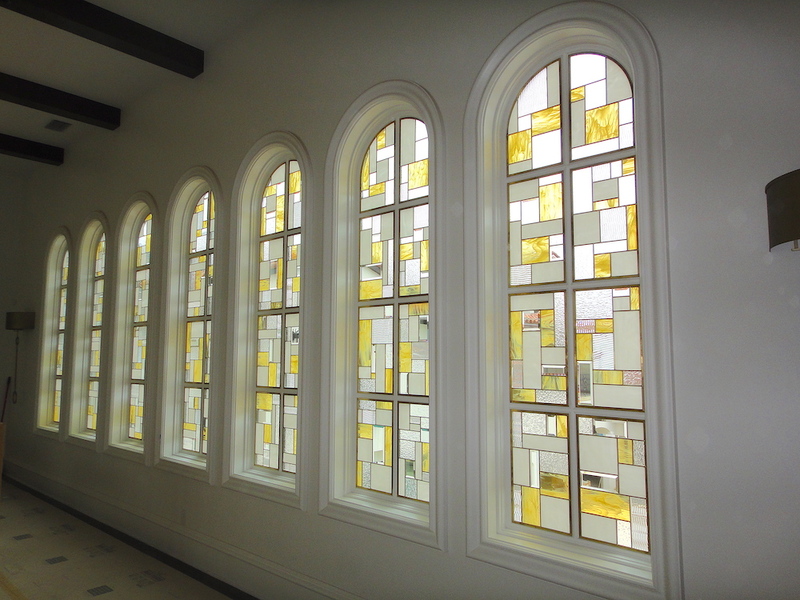 This process consists of sandwiching the stained glass panel between the existing glass and another plain glass pane, keeping it safe from both the external elements and the moisture in the bathroom itself. For more information about our gorgeous custom bathroom stained glass, please contact us today by phone or by using our online contact form.